Heat oil in a pan, add garlic, ginger&g.chillies & saute few seconds. Add the onion & tomato allow it to cook . Add the mushroom to the onion& tomato mix allow to cook. Now add the cream & mix well. check seasoning. Serve hot can accompany any kind of rice or bread. That mushroom curry looks awesome.. must've been great with chapathis. hey seems to be very easy and rich. good one. Cream adds a really nice touch to the mushrooms, looks great. 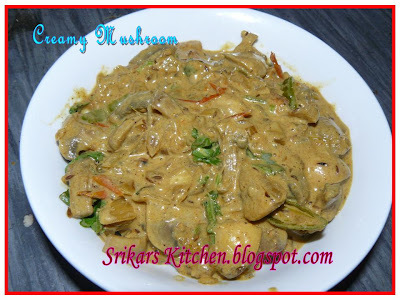 mushroom looks really awesome...creamy and rich texture..
Creamy Mushrooms looks very delicious..nice creamy texture n rich too..
Wow that mushroom curry looks super super delicious. yuuuuuummmmmmmmmmmmmy curry Srikars.Looking very tempting and a good curry with rice :). bookmarked will try next time I will buy mushrooms. I won't say no to anything wish mushrooms in it It looks so good. Sripriya, this dish looks yummy would try it today.